I've spent my limited sewing time over the past few months completing this quilt. 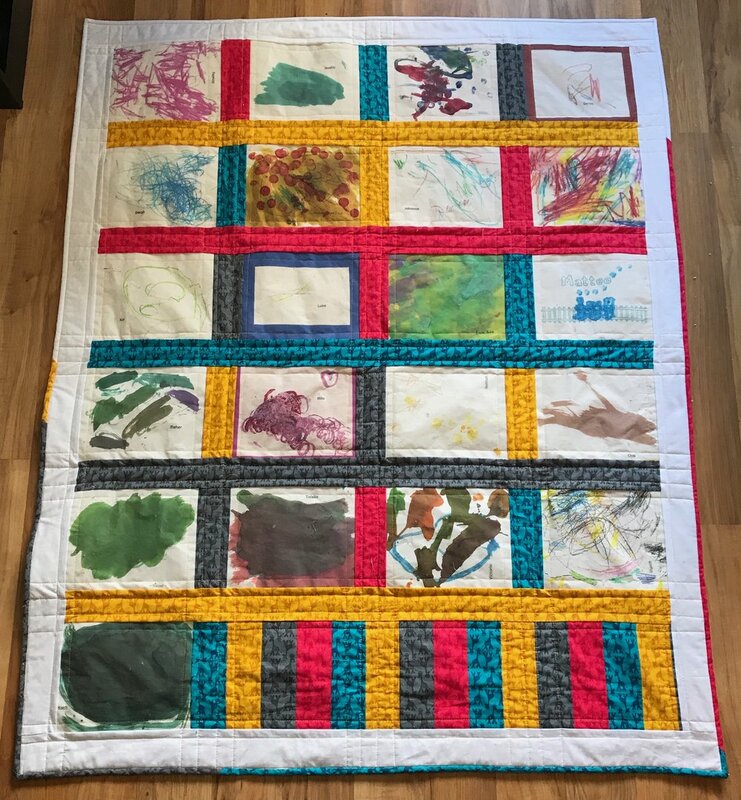 I was commissioned by my son's preschool to put assemble this quilt from fabric printed with art the kids in the 2 day class (2 1/2 to 3 1/2 years old) created. The completed quilt will be auctioned off at the school's silent auction fundraiser in May. The class coordinator ordered the quilt blocks through Original Works. I thought the fabric was very papery feeling and they obviously used an iron on transfer to get the art onto the fabric because when I tried to press my blocks the color started coming off. It was hard to sew and just about impossible to press with the Original Works quilt blocks. 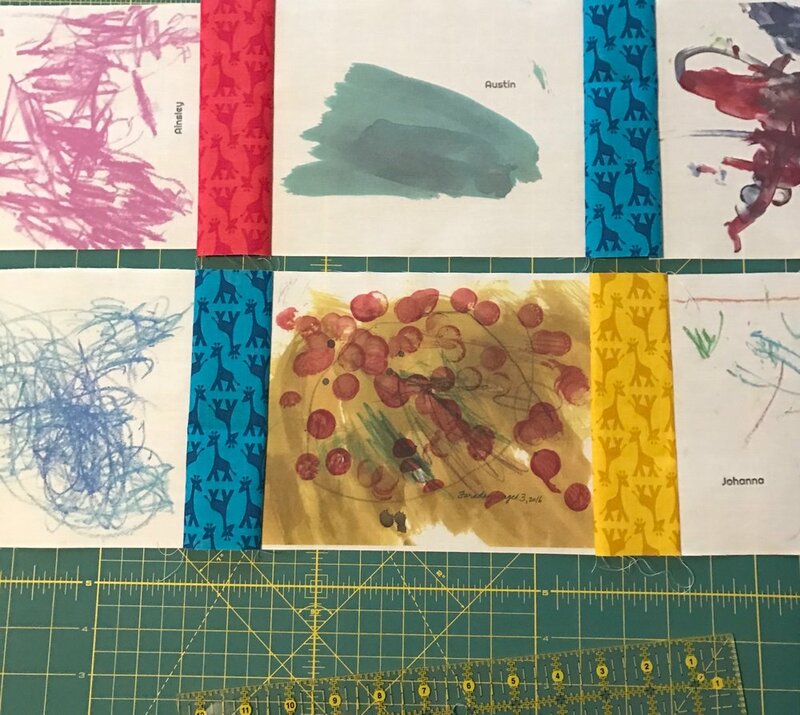 If we do this project again next year, I am going to suggest we use Spoonflower to get the kids' art on to a better quality fabric. I used simple 2 1/2" strips (if I hadn't wanted to use existing scraps to keep costs low for the school, I could have purchased a new Jelly Roll to make this really quick and easy). I sashed between each art block and then put a border around the entire thing. The back is yellow minky (yellow is the "class color" for their cubbies and name tags so I thought the kids would like that). I made the binding from even more scraps. The art blocks were a terribly awkward 7.875" wide by 6" high and the number of blocks was simply determined by the number of kids in the class so I'm not going to share exact measurements and yardage requirements for all the pieces of this quilt, but if you want to create your own, dimensions would be very easy to calculate with my Quilty Math Workbook. I like to take the total measurement of my piece and subtract 1/4" so that if my piece is not perfectly cut, excess is added to or subtracted from the seam allowance instead of my finished block. You could mark the entire stitching line but the end goal is to have 3 intersections so I only mark where my line would cross my existing seam and each end. Make a mark 1/4" in from each end that intersects the marks you made for your stitching line. You may want to make these marks on the wrong side of the fabric so that when you lay your pieces right sides together the marks are all on the sides facing up. Stick your pin straight through each of your intersections (use the diagonal seam in lieu of a second mark for your middle point). I find that if I stick my pin all the way through so that both layers of fabric are right up against the pin head, it works as a pivot point and helps get my fabrics lined up just right. I start with the middle point first and then do the ends. Depending on how wide your marks are, you may find it helpful to pin just to the inside or outside of your mark (this will depending on your exact measuring and marking technique). Stitch right along your marks (take your pins out as you go, don't stitch over them). Open up your piece and check that your seams line up to your satisfaction. Once it looks good, press your seam open. Your diagonal seams should line up perfectly.